The Mark IV was a greatly improved version of the first British tank, the Mark I. It was better protected and the fuel tank was relocated. 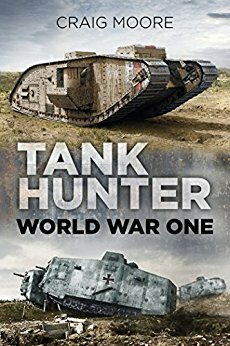 It was, numerically, the most important tank of the First World War, with 1220 built: 420 “male”, 595 “female” and 205 tenders. A Mark IV showing the proper use of the unditching beam. Before that, an early solution was the use of a wide 3.5 m (11ft 5in) wide fascine. The Mark I had proved to be far from perfect on the battlefield. Attrition rate was enormous. The Mark II and III, both training machines, featured many modifications to the original Mk.I. This culminated with the final Mark IV, a joint product of William Tritton and Major Walter Gordon Wilson. Basically, the Mark IV was a modified Mark I, taking into account all the war experience acquired on the front. The director of the Tank Supply Department, Albert Gerald Stern, was also instrumental in this process. He argued for the adoption of a new, more powerful engine and an improved transmission. But this project was ambitious, and the deadline of 1 April 1917 was never attained. Instead, to speed up production, as many parts as possible were borrowed from the Mark I. The early production version was armed with three (male) up to five (female) compact, light and reliable Lewis machine-guns (later Hotchkiss Mk.I), mounted in sponsons and the front of the hull. However the Hotchkiss, although sturdier and more affordable, was criticized for its lack of magazine capacity (14 rounds compared to 96 for the Lewis). Later this issue was solved with a new flexible 50 rounds ammunition strip. The QF 6pdr (57 mm) guns on the male tanks were now short-barreled. Another improvement was to carry a large fascine, made of brushwood bundle with chains, carried at the front. Later it was replaced by a chained unditching beam, reinforced with sheet metal, stored on two parallel rails running the entire length of the roof. 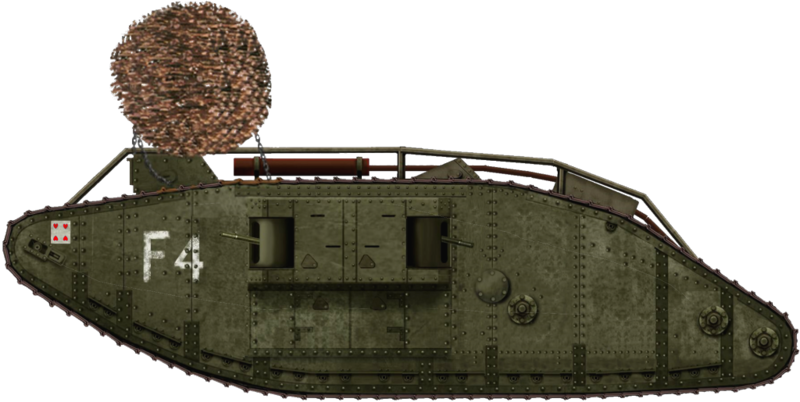 This provided better trench crossing capabilities, and became a trademark of the Mark V. Another attempt was the tadpole tail, a large extension of the rear tracks horns. But rigidity quickly proved an issue on trials and it was apparently never mounted on operational tanks. The main improvements were an increase of armor, up to 12 mm (0.47 in), and the relocation of the fuel tank. The later has enough room for 265 l (70 gallons), for an operational range of 56 km (35 mi). The Mark IV was propelled by the Daimler-Foster, 6-cylinder in-line sleeve valve petrol engine, which developed 105 bhp at 1,000 rpm, allowing a speed of 6.4 km/h (4 mph). Transmission had 2 forward and 1 reverse primary gears and 2 speed secondary gears. It was still relatively complex for the driver, but an improvement over the previous models. 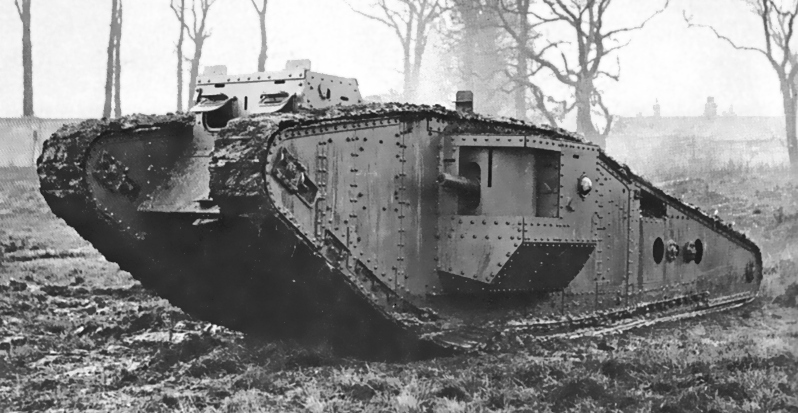 Due to the urgent need for tanks the production of the Mark IV was dispatched to Metropolitan, Fosters of Lincoln, Armstrong-Whitworth, Coventry Ordnance Works, William Beardmore & Co and Mirrlees, Watson & Co. An initial order of 1000 tanks was issued by the War Office in August 1917. The last were delivered after the armistice in November 1918. They had been converted to armored tank tenders (205 in all). Standard production was 420 “male” and 595 “female”. Normal weight, in battle order, was 28.4 tons (male) and 27.4 tons (female). Ammunition provision for the males consisted of 180 HE rounds. Unit cost was about about £5,000. Two variants of the design appeared. One equipped with a “tadpole tail”, never to be used on the battlefield. The other was the mass-produced tank tender, which was identical to the regular female, but unarmed. They carried gasoline and ammunition. First blood for the Mark IV came on June 7th, 1917, with the attack of Messine Ridge. The terrain was very rugged, heavily cratered, but cold and dry, which allowed some sixty plus tanks some success, although lagging behind the infantry. Later, during the third battle of Ypres (31st of July), most of the Mark IVs committed literally sank in the mud. The power to weight ratio was such that in a heavily cratered terrain and swampy ground, the Mark IVs frequently bogged down and the overheating and overused engines usually broke down in the process of bailing out. Most fell prey to German artillery or were captured afterwards. Their contribution was insignificant. However in November 1917, at Cambrai, a large concentration of Mark IV’s (460) proved decisive despite a complicated and well-defended trench system. During the German spring offensive, British officers discovered in surprise some German assault troops were accompanied by captured Mark I and IV. These “Beutepanzer” sightings rose so often that encounters with the German-built A7V were rare in comparison. 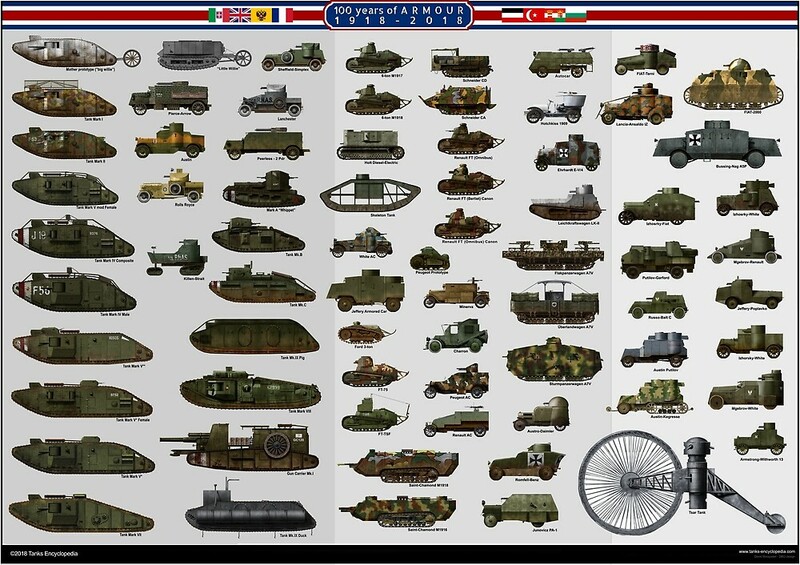 This led the War Office to order the modification of the armament of some Mark Vs into “hermaphrodites”, fitted on one side with a female sponson, and the other side a male sponson, to give these tanks a way to deal with enemy armor should they come across it. However, the first tank-to-tank duel involved one of these German A7V during the second battle of Villers-Betonneux, in April 1918. Two British Mark IV female and one male spotted and engaged the A7V. But after several miss-hits, the two Females, useless, retired. After many shots and two hits, both tanks retired in a draw. When the Mark V, better protected, with a better engine and greater speed came into service, the production of the Mark IV was phased out and the last converted as supply tanks. No Mark IV seemed to have been sent to the Whites in Russia. However, a few Beutepanzer Mark IV took part in the revolutionary events in 1919, on the army’s side. Seven Mark IV have survived. The Female “Flirt II” is displayed at Museum of Lincolnshire Life, and another one is at Ashford (Kent). One male, “Lodestar III” is hosted in Belgium, at the Royal Museum of the Army in Brussels, while another, a female “Grit” is on display at the Australian War Memorial. The “Deborah”, a female, was excavated at the village of Flesquières in France. It is now been restored, possibly for display at Saumur.A former war bond tank, the “Liberty”, is under restoration at the United States Army Ordnance Museum, Aberdeen, Maryland, after decades of decay. A male, the “Excellent”, which later became HMS Excellent, was used at a Royal Navy shore establishment training camp, and later kept fully functional for the Home Guard in 1940. It is now an exhibit at the Bovington tank museum and the only one in the world in running condition. 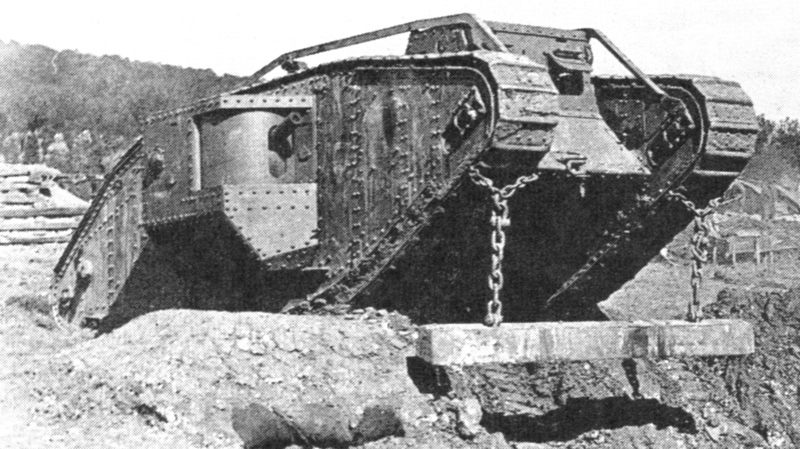 One of the few Mark IV experimentally fitted with a “tadpole tail”, to help with the crossing of large trenches, like those of the Hindenburg line. This added part never shown enough sturdiness and production never materialized. The idea of a longer hull was realized by the Mark V*, a variant of the former, at the end of the war. 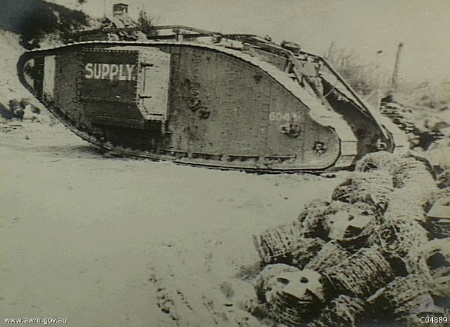 A Mark IV converted as supply tank, in 1918, at Villers-Bretonneux. 205 of these were built or converted on the stocks when the Mark V came to replace older models. 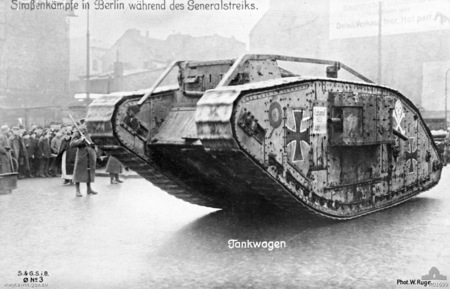 A captured Mark IV in Berlin, during the military repression of the Spartacus league, within the German revolution, 1919. Nearly forty Mk. IV were captured during the course of the war, and pressed in service as “Beutepanzer Wagen” by the Germans, with big Malta crosses to prevent friendly fire. In some case, British armament was replaced by German guns and machine-guns, and the crew boosted to twelve. Dimensions Length 26ft 5in (8.05m). Width without sponsons 8ft 4in (2.54 m). Width Male with sponsons 13ft 6in (4.11 m). Width Female with sponsons 10ft 6in (3.20 m). Mark IV Male of an unknown unit, St Omer, May 1918. regular dark khaki livery. Notice the three white and red bands and the crew symbol (the “red hand”). Modifications compared to the Mark I included reinforced armor, a relocated fuel tank, an extra front machine-gun and better trench crossing equipment. Mark IV Female, equipped with Lewis machine-guns, Ypres, July 1917. Trench crossing capabilities were relatively good due to the very large rhomboid tracks, but the power-to-weight ratio was so feeble that big slopes and deep craters proved impassable, and various solutions were tested. Among them a pair of very large arms (attached to the front), each fitted with a roller and a long “tadpole tail” at the rear, but both solutions proved costly and unpractical. A simpler idea proved successful: a pair of parallel rails, running over the roof, sustaining a very large fascine or an unditching beam. The fascine were also used to assault the antitank trenches of the Hindenburg line. Mark IV Male “Kelly’s Heroes”, Palestinian campaign, battle of Megiddo, 21 September 1918. Around 200 Mark IV were sent by order of General Allenby to this sector to help the breaking through of the Turkish lines towards Jordan. As the conditions in the desert were largely different than those in Europe, the rail and unditching beam were dismounted. The flat ground allowed better speed, but because of the scorching heat the engine overheated and crew comfort suffered. The Mark IV Male tank ‘Hyacinth’ H45 of H Battalion, 24th Company, 10 Sec was ditched in a German trench while supporting the 1st Battalion, Leicestershire Regiment, one mile west of Ribecourt. 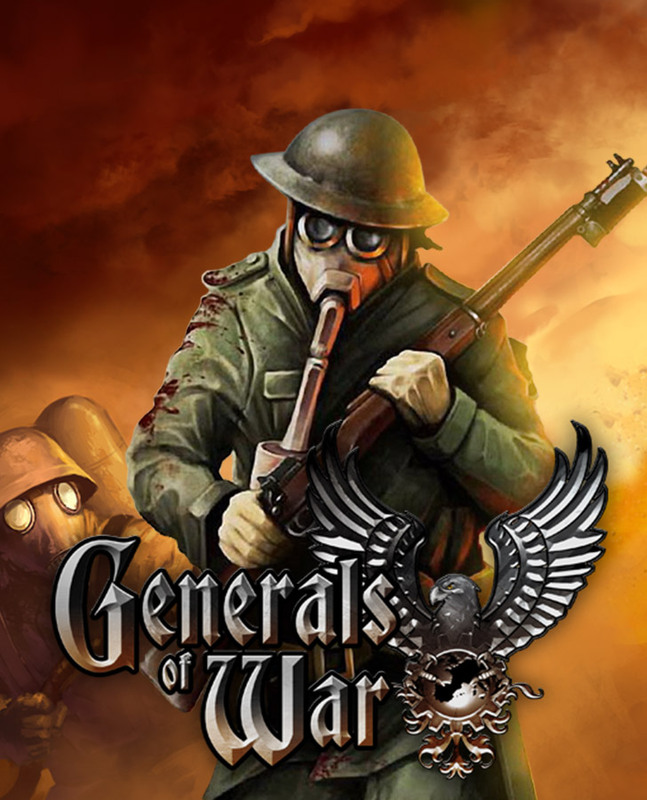 It was commanded by 2nd lieutenant F.H. Jackson. It reached the starting point and the 1st objective as it attacked the Hindenburg Line trench system. Notice the red letter Z hand painted over the vision slit in an effort to conceal its locations from snipers and machine gunners.No white red and white identification stripes at the front yet as German tanks or Beutepanzers had not been encountered on the battlefield yet. 20 November 1917, Battle of Cambrai. Male Mark IV tank 2021 C24/C23 Crusty captured. Notice the artwork at the rear and the pattern on the sponson to confuse German snipers as to where the vision ports were. Six Mark IV tanks were used to raise money for the war effort. They toured the towns and cities of Great Britain from November 1917 to the end of WW1 on 11th November 1918. This was an encouragement for people to buy government War Bonds and War Savings Certificates. This tank is No.130 Nelson tank and was on display in Trafalgar Square, London. Beutepanzer Mark IV Male. By the beginning of the summer in 1918 the Germans had recovered a large number of abandoned Allied tanks. After the successes of the Spring Offensive in 1918 and the recapturing of most of the November 1917 Cambrai battlefield, over 300 damaged tanks were now situated behind German lines. Over 100 British Mark IV tanks were refurbished and prepared to fight for their new masters. They were called Beutepanzers (Trophy tanks). BeutepanzerWagen IV(b) female Large German Army black crosses, a type of Christian cross with arms that narrow in the centre and have a white border called a ‘Bundeswehr Schwarzes Kreuz’ were painted on the captured tanks to identify the fact that they were under new management. The design of the German identification black cross changed in the second half of 1918 to the ‘Balkenkreuz’ (beam or bar cross). Some of the later repaired Beutepanzers had this newer cross design painted on their sides instead. Supply Mark IV “Auld Reekie” The Army needed a method of resupplying the tanks on the battlefield and the simplest option was to build new or convert old tanks into supply tanks. Their armoured hulls would protect the crew and the stores it was transporting. As it was a tracked vehicle it could cross the same terrain that the battle tanks were driving across. I remember my father saying that he was in the first six tanks to go in 1916 initially the Germans and our soldiers ran away from his tank on the first day but by the third day his tank got hit and disabled. He was invalided back to England and went up to Keswick to recover. He said that the whole crew was needed to start the engine and it glowed dark red in the inside of the tank. He said that you could actually see the pistons going up and down inside the water jackets. Fascinating, thanks for sharing, Brian. A chap in Poelkappelle, Belgium, is building a replica – he seems to have the necessary drawings. Perhaps he will share where he found them. See the facebook group “tank poelkapelle”. Any chance for an identification of a Mk. IV male tank named xxdise and the last part of the number on the rear are 67 ? Picture of it was taken in april/may 1918 when taken by the germans (IR 357). You have confused the functions of the fascine and the unditching beam. The fascine was used only at Cambrai. It was dropped into a trench and acted as a stepping stone for the tank. It was a single-use device. The beam was intended to extricate the tank from craters, boggy ground, and other such obstacles. It was to be disconnected after use and stored on top of the tank, ready for further use. No Mark I tanks were used as Beutepanzer by the Germans; only Mark IVs. The Mark IV didn’t have an “extra front machine gun”. It had the same number of machine guns as the Mark I.
Rochdale Borough Council would like to get a copy of the image top right of this article, showing mk IV training tank and with trees in the background. People of Milnrow in Rochdale raised £180k in war week to pay for their own mk IV female training tank, with guns when on active service and after the war it was placed at the bottom of Kiln Lane in Milnrow until it was removed in 1934 due to health and safety concerns with children playing on and in it. Royal British Legion Industries will create a nearly lifesize cut out of the image which we will place at the site on Kiln Lane. Problem = picture on your web page isn’t high enough definition – only 180kb – do you have the original photo in any higher quality / size? We are sorry, but we don’t own the rights to this image. However, I have forwarded your request to our British WWI expert, he might be able to help you! Hi. With regards to the first tank duel, pretty sure the Mk 4 Male was able to heavily damage the A7V, which led the German crew to bail out. So it was actually a British victory.